During the fall and winter months of "cuffing season," many people find themselves in fresh relationships. Should you talk with your significant other about finances? To get a pulse on how millennials are broaching the topics of finance and savings, we surveyed 1,000 people from across the United States — of all backgrounds and gender. While the majority of millennials find money to be a critical topic, most actually don’t bring up the conversation. We found that nearly 68% of millennials haven't asked their partners about their savings, credit score, or debt. Although 65% of millennials believe that discussing finances is essential, nearly the same amount of people haven’t actually talked money issues with their partners. Bringing up savings and credit scores can be uncomfortable. Will your partner be open to questions about their finances? How will your views differ on money? The unknowns can make it tough to bring up the topic, but it doesn’t mean you shouldn’t. If you’re not ready to share everything, it might be a good idea to start small. Chandler Williams, a 24-year-old project manager in San Diego, California, began to talk with her boyfriend about money out of necessity. “About eight months into our relationship we moved into our first apartment together, so we had to talk about credit scores and housing budgets. My (credit score) was pretty low and his was super high. Honestly, his score was what helped us get the apartment. We don’t necessarily talk about every (financial) detail, but we do have a general idea of the other person’s finances. We found that older millennials are more likely to have a conversation about finances. Nearly 57% of couples in the 25-34 age range have talked about finances, compared with only 27% of those aged 18-24. Perhaps due to increased experience and the ability to save more, those slightly older feel more comfortable to discuss finances. They might also feel like they’re closer to engagement or marriage — prompting them to have more proactive conversations about their future ahead. When we surveyed American millennials, we asked if they believe talking about money with a significant other is necessary. Approximately 7 in 10 people answered that after six months to a year, asking about a partner's credit score, savings and debt contributes to a successful long-term relationship. For Sa El, a 33-year-old licensed insurance agent and co-founder of Simply Insurance in Sandy Springs, Georgia, it felt natural to talk about money with his then boyfriend (now husband). “As an Aries, (my husband) is all about making sure things are done the right way. So our money conversations started early,” El jokes. Financial standing plays into the future vision of a life together — including how you might combine finances down the road and what retirement goals you have. While every couple should decide the financial arrangement that works for them, having a conversation opens up the door to talk about important topics and avoid future conflicts or surprises. Don’t worry if your finances aren’t crystal clean, either. Over 86% of respondents said if they found out their partner had a low credit score, they would try to help improve it. When Stacey Bishop, a 28-year-old engineer from Cincinnati, Ohio, first swapped credit score numbers with her fiance, she felt self-conscious that hers was lower. “For about four years of our relationship, I had a much lower credit score than him and it wasn’t just as a result of poor financial management. If the situation were reversed, I would definitely give him the benefit of the doubt. Similarly, 58% of people said that if they discovered their credit score was lower than their partner’s, they would feel motivated improve to it. 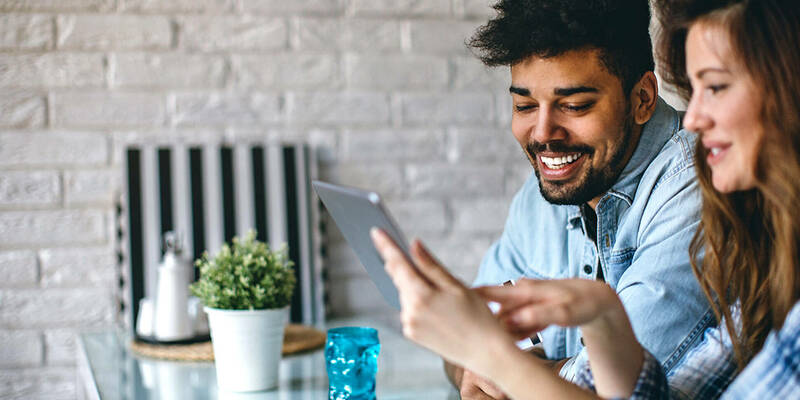 While it might seem daunting to share financial information, it can reap positive rewards for both you and your partner. El explains, “It’s important to build credit together. When you have a spouse with poor credit, then you should do all the tasks necessary to build their credit out so it matches yours because (a low credit score) can harm your joint finances. Broaching topics like credit history and debt might occur before a ring is on the finger. 51% of millennials, though, expressed that they would wait until after marriage to discuss having a joint checking or savings account. Another 34% of millennials say they wouldn’t bring it up until at least after the engagement. Overall, less than 15% — of both men and women — believe joint accounts should be brought up prior to a marriage commitment. It may not be too surprising, though, that the majority of couples wait to talk about joint accounts. It’s rare for a couple to have a joint account before marriage, although it does happen and can make financial sense. Even after marriage, not all couples decide a joint account is right for them. Others choose to have one joint account, while also keeping separate accounts for themselves. For El and his husband, it was important to combine accounts prior to marriage: “Having these (money) conversations is different for the LGBTQ population, because marriage wasn’t possible for some LGBTQ people until a few years ago. If we had been able to get married sooner, we would have. And for some couples, like Bishop and her fiance, having a joint account simply isn’t a priority. Millennials agree that discussing finances with a partner is important for a healthy, long-term relationship. However, many aren’t bringing up the topic proactively. Having a conversation with your partner about savings, debt, and credit score can help solidify your bond and give you a better plan for the future. It can also help encourage a positive method for improving credit scores or building savings. By approaching these topics together, you’re more likely to be on the same page and design a strong financial outlook for the future. Should Everything Be Split 50/50 In Relationships?